The neo-classical theater known today as the Apollo Theater was designed by George Keister and first owned by Sidney Cohen. In 1914, Benjamin Hurtig and Harry Seamon obtained a thirty-year lease on the newly constructed theater calling it Hurtig and Seamon�s New Burlesque Theater until it was shut down in 1933 during a campaign against burlesque. 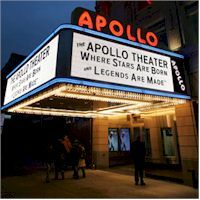 It was reopened as the 125th Street Apollo Theatre in 1934, changing the shows to variety reviews and redirecting the marketing attention to the growing African-American community in Harlem. The Apollo Theater experienced several changes in management and closed altogether from time to time. In 1983, the Apollo received state and city landmark status. Today, the Apollo, which functions under the guidance of a Board of Directors, presents concerts, performing arts, education and community outreach programs. The Apollo Theater New York is one of the top New York City venues for concerts and other events. Don't miss some of the biggest names in music as they come to New York City area's Apollo Theater New York to perform live.